Administration (NASA) aerospace engineer and the first Black Woman to earn a doctorate in the field. 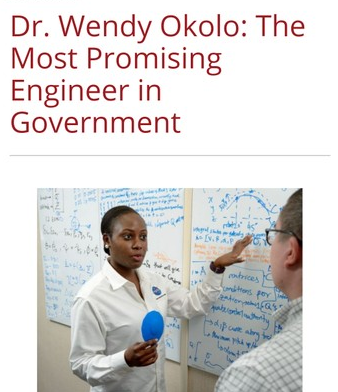 According to her profile, Okolo works as a special emphasis programs manager at Ames Research Center and is a research engineer in the Discovery and Systems Health Technology (DaSH) Area. Her role includes researching control systems applications, systems health monitoring and creating solutions for issues related to the designing of aircraft and spacecraft. She earned her B.S. and Ph.D. at the University of Texas at Arlington in 2010 and 2015. 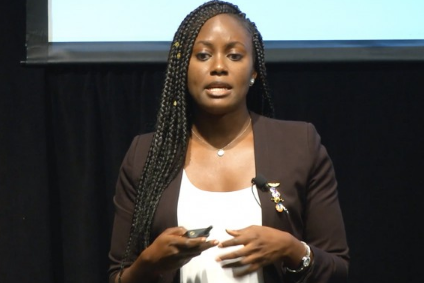 Okolo completed her dissertation research with a focus on aircraft fuel-saving methods. Her research was funded by several organizations including the Air Force Office of Scientific Research (AFOSR), American Institute for Aeronautics & Astronautics (AIAA) and Texas Space Grant Consortium (TSGC). After completing her graduate studies, she worked a summer researcher at Wright-Patterson Air Force Base in the Control Design and Analysis Branch at the Air Force Research Laboratory. While there, Okolo piloted one of the world’s fastest crewed aircraft. According to the Philadelphia Tribune, Okolo earned her doctorate in aerospace engineering at just 26 years old. Along with accomplishing the prestigious honor, she was the winner of the Black Engineer of the Year Awards (BEYA) Global Competitiveness Conference award for being the most promising engineer in the United States government.